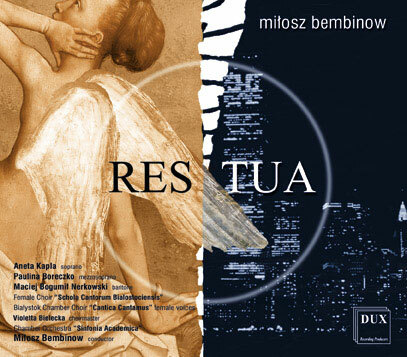 The oratorio RES TUA – Deliberations of Love and Hate was composed in 2002 and inscribed to prof. Violetta Bielecka and her Female Choir “Schola Cantorum Bialostociensis”. The text of RES TUA consists of excerpts from the biblical Book of Psalms and “Song of Songs” quoted in Latin language and combined with traditional Latin and English proverbs. The whole piece is designed in a way that enables quotations gather more universal implications, exceeding their purely religious context. This mainly comes from the need to rise above cultural, nationalistic and religious divisons. Miłosz Bembinow, Warsaw 13 of April 2005.